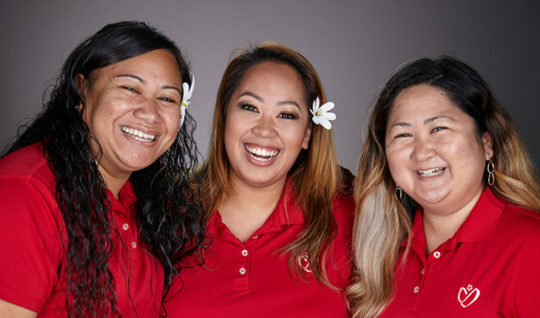 Hawaii State FCU was founded in 1936 by a handful of government workers who believed in people helping people and watching out for one another’s back. Today, we still live by those founding ideals, ensuring that we are Always Right by You throughout your financial journey. Wherever you go in the U.S. you’ll find a surcharge-free ATM where you can access your money as part of the Co-Op Network of ATMs. As a not-for-profit, all of our profits go back to you in the form of better rates, lower fees and innovative services. We are part of the Shared Branching Network, which means you can access your money at other Hawaii credit unions, or at 5,000+ locations throughout the U.S.
We’re owned and operated by our members, including active and retired state, city and Hawaii State FCU employees, their immediate families and household members, and family of existing Hawaii State FCU members. Also, any employee or member of a Select Employee Group (SEG) enrolled with Hawaii State FCU is eligible to join. Hawaii State FCU is one of the state’s leading financial institutions. We’re continually integrating new and innovative technologies to offer members greater convenience. That includes a mobile app to help our members manage their accounts on the go. We also offer a full range of financial services, including savings and checking accounts, mortgage loans, Home Equity Lines of Credit, debit and credit cards, as well as some of the best loan rates around. The credit union belongs to a shared-branch service of more than 30 other credit union locations statewide. Hawaii State FCU members can visit any of these participating Shared Branch credit union locations to take care of their banking needs. At Hawaii State FCU, we work hard every day to help you achieve your financial goals. You won’t see the behind-the-scenes action, but you will enjoy the speed and convenience of the process in the branches, over the phone and online through Online Banking and our Mobile App.